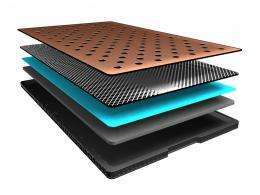 (PhysOrg.com) -- A new breed of rechargeable zinc-air batteries is soon to be available, and may replace lithium-ion batteries in cell phones, laptops and other consumer items. Lithium-ion batteries store only a third of the energy and cost around twice as much as the new batteries. The Swiss company ReVolt, from Staefa, plans to release the new batteries next year, initially as small batteries for use in hearing aids, and later for cell phones. Eventually much larger batteries are planned for electric vehicles. 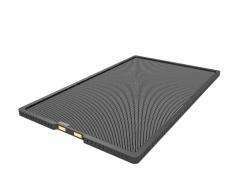 The new battery was developed in Trondheim in Norway by the SINTEF Group, the largest independent research institution in Scandinavia, and ReVolt was formed to market the device. Zinc-air batteries need oxygen from the air to generate the current. They are safer than lithium-ion batteries because they do not contain volatile materials, and therefore do not catch fire. Non-rechargeable zinc-air batteries have been available for some time, but rechargeable versions have proved more difficult to develop. The battery consists of an "air" electrode, an electrolyte, and a zinc electrode, all set in a casing that lets in air. When the battery is discharging the air electrode (with the help of catalysts) produces hydroxyl ions in the aqueous electrolyte. At the zinc electrode the hydroxyl ions oxidize the zinc, a process that releases electrons to form an electric current. During recharging the process is reversed, with oxygen being released at the air electrode. In previous rechargeable zinc-air batteries the air electrolyte became deactivated and the reduction and oxidation reactions slowed or stopped after a few discharge/recharge cycles. The battery function could also be degraded if the water-based electrolyte dried out or was absorbed too deeply into the pores, and if the zinc deposited in the recharge cycles built up unevenly, which could cause short circuits. The new battery uses gelling and binding agents to control the zinc electrode shape, and controls the humidity inside the battery. The new catalysts used have been tested and found to improve both the reduction and production of oxygen during discharge/recharge cycles. Prototypes of the new battery have been tested for more than a hundred cycles, and are expected to last at least twice as long. CEO of ReVolt, James McDougall, said the company aims to increase the life to between 300 and 500 cycles, which would make them useful for cell phones and electric bicycles. ReVolt has also been developing zinc-air batteries for use in electric vehicles. These batteries resemble fuel cells, with a zinc slurry forming a liquid zinc electrode, and a series of tubes forming the air electrode. Electricity is generated by pumping the slurry through the tubes, where it is oxidized and releases electrons. The resultant zinc oxide is stored in another compartment and flows back through the tubes when the battery is recharging. This releases oxygen, and the zinc oxide reverts to zinc. Since the slurry can be in greater volume than the air electrode, the energy density is increased and more electricity is produced. McDougall expects the batteries to last much longer too, for up to 10,000 discharge/recharge cycles. The battery could also be repaired, by replacing failed parts such as the air electrode. The zinc-air battery for hearing aids will be available next year. The battery for electric vehicles is still some years away from mass marketing. This is exciting! So our devices will be using up our oxygen as well :P No that can't be a problem, however the sun is a wonderful alternative (because it's unlimited and way plentiful), but for phones, iPods, and other devices that don't see the sun too often, this is a great thing. And possibly one could "re-charge" the battery, simply by refilling the zinc tank and pumping out the zinc oxide tank. And what of Aluminium or Magnesium batteries? Its exciting to see battery technology showing no signs of slowing down. If we can get cars with 1000 mile ranges I think electric vehicles could really take off. Obviously the normal driver doesn't need that sort of range but people do take road trips and expect to be able to get to where they need to go without having to charge the battery for 3 hours every 250 miles. What about nano enabled batteries, are they still on the way? I wish one of these tech's would stop being 'on the way' and be available! It's so badly needed for so many things. 1000 miles??? Wow, talk about setting the bar high. 85% of drivers drive less then 40 miles a day. You go do the math. Actually, I think that's pretty realistic. The Tesla Model-S is supposed to get 300 miles on its lithium-ion batteries. If these batteries have three times the energy density then it shouldn't be a problem to get to 1000. If you could go to a station and swap exhausted goo for charged goo as David 42 suggested you'd be laughing. It has been thought of before with redox flow batteries. You pump out spent electrolyte and pump in the charged electrolyte. But those batteries have 5 times lower energy density than Li-Ion. With these zinc air batteries, you may have the energy, but you don't have the power. Meaning it stores a lot but it will charge VERY slowly and provide VERY low power to drive the car. 1) Energy density, the hot topic everywhere. How much can it store per unit of weight or volume. 2) Power density, few people realize it is the reason why Lithium air or Zinc air batteries aren't suited to the automotive market. How fast energy can be transfered to and from the battery. 3) Cost $$$ the most important factor really. 5) Environmental sustainability, availibility, toxicity, volitility, crash durability, thermal tolerances, etc. This is one of the most exciting fields in science today. I'll settle for a 300 mile range, that's what my gas powered car currently gets. 1000 miles would be absolutely wonderful, but I can live without it. I'd get an electric plugin car if it even get 100 miles to a charge. That would be just fine for what I'd use it for. I'll settle for a 300 mile range, that's what my gas powered car currently gets. Think again: When your current car reaches 300 miles you simply go to a gas station and are ready to continue your trip in a few minutes. With current battery technology those 300 miles would be all you get in one day. If your destination is further away: tough luck - get a hotel while your car recharges. However, I could envision using a modular approach: Have a scaled down trailer with additional batteries which you attach for long distance journeys. When you only do day-to-day, short distance driving unhook it and leave it at your base (at home or the place where you drove to on vacation). No, I don't work for the company, but had saved a notice about the battery from 2007, and this article prompted me to see where they've gone since then. I don't know how they compare to the zinc-air batteries, but they're much further along in development. The two largest markets for batteries will have very different requirements: motive and stationary. Motive applications include vehicles and personal electronics and are the most challenging. However, stationary applications, such as utility scale battery plants, are much less challenging and also encompass an enormous market potential. Note that energy density is not a deal-breaker in stationary battery systems, as with motive ones. This is where I believe the first breakthroughs will occur, also because there are not the same market forces hindering a quick adaptation to electric technology, as is the case with vehicles. Altair Nanotechnologies already produces batteries that have been independently verified as to range, recharge times and cycles. Their Lithium Titanate recharges in about 10 minutes, range is up to 130 miles at highway speeds and cycles are rated to about 1500, if I recollect properly. They are about 10K USD more than comparable internal combustion vehicles, they should soon produce packs to support 300+ mile ranges. They also can recharge overnight on regular household circuits. Biggest drawback would be grid issues in supplying charge power for eight or more charging units at a typical fueling station. They have also demonstrated a 65 passenger bus.